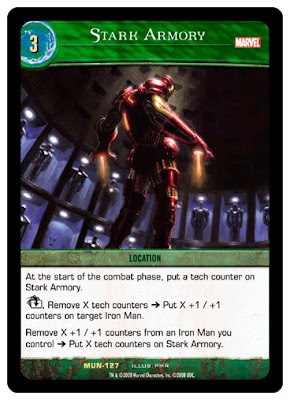 I found this pic on-line while searching around for Iron Man armory pics. This cover, my first for Marvel, was painted over 7 years ago (while I was still working at the legendary Olive Garden). I'm glad to see that it's still being used. I've also heard from a reliable source that a print of this was hanging around the production offices of the Iron Man movie. When they released the first batch of photos from the set of Iron Man 2, I couldn't help but notice that Stark's suits were starting to form a circle. That, of course, doesn't mean they were using me for inspiration, but that's what I'm going to tell everyone! We'll know for sure if there's an electrical outlet behind every suit. Thanks, Andrea. That's one of the few times I documented the process for an oil painting. I still have a couple others, but I haven't gotten a chance to post them yet. Maybe some day! That is so awesome. Hey man, you never know if they used yours for inspiration, give yourself some credit ;) this Iron Man piece is serious bad assery at it's finest. Thanks for the vote of confidence, Eric.